Cristal Windows are able to supply and install a range of classical timber windows across Fleet, Hampshire, Farnham, Camberley, Surrey, parts of Berkshire, Aldershot, Basingstoke, Hook, Farnborough, Bagshot, Lightwater, Cove, Frimley, Yateley and surrounding areas. These beautiful double glazed windows add charm and character to any property, whether it’s new build, or period. Contact us for more information. When you are looking for a stylish finish to your home in Fleet, Hampshire, Farnham, Camberley, Aldershot, Basingstoke, Hook, Farnborough, Bagshot, Lightwater, Cove, Frimley and Yateley, then our timber windows are the perfect choice. These gorgeous windows provide an element of charm coupled with traditional character to your home, and can suit any style of property. They are a popular alternative to uPVC windows, as modern timber windows are designed to be secure, weather resistant and energy efficient. We offer a wide range of designs for you to choose from for your home, so whatever particular style suits you, we are sure to find a timber window to match in our collection. Our timber windows are also incredibly sturdy and robust, as they are fabricated by highly trained craftsmen who use traditional joinery techniques. This creates almost seamless joints that are strong and tough, giving your timber windows a durable frame. Your timber windows can come in almost any style, and the full range we offer can be beautifully finished to complement your home. We offer a range of traditional varnishes and stains as well as coloured coatings. Our timber windows frames use cutting edge products to ensure their high performance weather resistance, meaning less maintenance for you. Due to the design of the timber frame, our windows are impressively secure. This is then enhanced by our range of high end multi-point locking mechanisms. The two combined provide superb security meaning that your family and home will be protected against intruders at all times. You can count on the security performance of these wonderful timber windows. Unlike traditional timber windows, which were draughty and let heat out, our modern timber windows offer fantastic energy efficiency. They are fabricated using state of the art construction and materials that ensure each double glazed window achieves an excellent Windows Energy Rating. 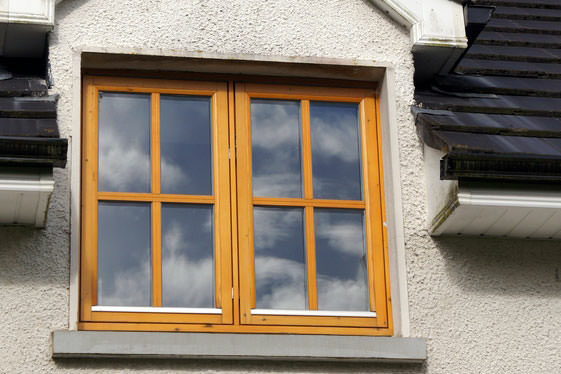 There will be no draughts and heat loss is minimised with a new timber window from us. Our unrivalled 10 year fully insured guarantee comes with our full range of timber windows. You can be confident that your timber windows will stand the test of time, giving you quality and service for many years to come. Our guarantee is one of the most comprehensive on the market and is highly regarded by our countless customers. We want you to have high quality products at the best possible price, so our timber windows in Fleet and Hampshire are priced to be superbly competitive. You will find that these outstanding double glazed windows offer a cost effective solution that will look simply stunning when installed in your home. To get an idea of how much your replacement timber windows will cost, please contact us and we will provide you with a tailored quote at absolutely no charge.